Well the votes are in and the bold binding has won. I cut all my strips and joined for approximately 290"+ of 2.5" strips. 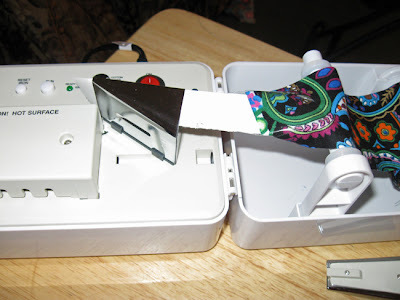 I pulled out the purchased, but not used yet, Simplicity's Bias Tape Maker. The directions weren't fantastic but they got me through. I rolled my strip on to the spool but realized the foam bottom was hitting that much binding so I took it out. My biggest issue was trying to get the fabric into the biding clip to feed under the iron. I tried using the "window" to pull through, but, I could not get it so I was going to give up. Then I got desperate and taped the fabric to a thin piece of cardboard and fed it through. Worked like a charm for me but I was concerned the tape would come off and stick inside the binding clip. I was able to test out the process with a single 2.5 in strip. When I got it set under the iron cover and then replaced the cover and pressed start on the machine. I had to hold the iron cover to get the strip to feed. Here it turned out I did not pull the iron cover left into locked position. Once I did that, the real binding strip fed through so fast!. I am in love with this machine now. Wow, that was fast!. Here's a little snippet I took. Also, here's the video from simplicity. Just click on the video tab, I could link directly to it! Here's my quick video of how fast this item works. Not the best quality but will do. Enjoy! I just saw this little machine in my magazine...it really works well eh? I was intrigued by it but think that my cutting out and sewing is what takes the time, not the folding but a great idea! Trish, will this little machine only work with bias cut strips? Thanks for posting this. I got the machine as a gift with the extra tips. Was very excited, but I am haaving issues with getting the larger 1-1/4 to work properly. My strips are cut 2-1/2, but unlike the smaller tips, the fabric inserts through the side and half of the top, I'm just not getting this. Do you have any advice for me. I just turned 60 and am hoping I'm not brain dead yet. Thank you. Anything to do with sewing I am always interested in. I hardly buy any thing but this one caught my interest. It is so great. I love my machine and hope to get some different size tips to go with it. Great to make up binding ahead of time for your sewing projects. Thanks Simplicity for a wonderful helper.